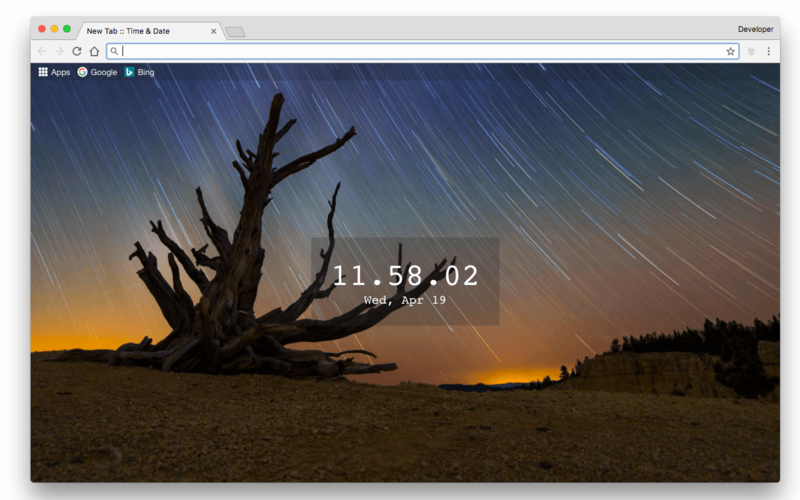 "New Tab :: Date & Time" simplifies your new tab look to a time and date view plus a background wallpaper from bing's daily collection. You have still access to the bookmarks bar and your apps like the original new tab page; however, the clutter caused by the top and featured sites is removed. This new tab is very lightweight and does not consume any resource when it is inactive. What is the "New Tab :: Date & Time" extension and how does it work? This extension aims to provide a lightweight and simple new tab that replaces the original one. Usually browsers display the list of top visited sites plus some featured websites in the new tabs; however by installing this extension, the original cluttered new tab will be replaced by a sample time and date view that is backgrounded with bing's daily wallpaper. How can I add a new link to the bookmarks bar? Just like the original new tab, drag and drop a link to the area. This way the link will be placed in the area. Upon insertion, the extension will try to find a proper title for this newly added link. If the title is resolvable from this link, it will be replaced the URL after a few seconds. To remove an item from the bookmarks bar, simply right click over the link and press "Remove this link". Why does this extension require permission to access all URLs? Upon inserting a new link in the bookmarks bar, extension tries to resolve the title from the URL. To do this, extension fetches the document of the URL similar to opening it in a new tab and extracts the title from this document. To have access to the fetch API, all_url permission is required. After this extension is installed and the new tab is replaced, there is no search-box anymore! how can I do my searches as usual? The search-box is removed to prevent cluttering your new tab and because there is no need for it! To search just type a phrase in the address-bar and hit the Enter key. This is exactly what the original new tab does. It just changes focus to the address-bar when the built-in search-box is focused.